Copernicus is "Europe's eyes on Earth" - the European Union's Earth Observing Programme. 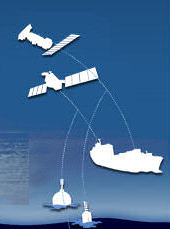 Using both satellite and in situ observations, it provides services that deliver near-real-time data on a global level. This data, which is freely available, can be also used at a regional or local level. NEREUS (Network of European Regions Using Space Technologies) has released a publication entitled "The ever growing use of Copernicus across Europe's regions". This publication describes 99 cases where Copernicus services have been used by regional and local authorities. One of these success stories features KAPTAN, the smartphone app developed during the CALYPSO Follow-on project. The publication was launched during an event, organised by NEREUS, together with the European Commission and the European Space Agency, held at the European Parliament on 22nd November 2018. During this event, public authorities, decision-makers, entrepreneurs and students had the opportunity to listen to the experiences of civil servants who are able to deliver services more effectively and efficiently as a result of the support given by the Copernicus services.